The other day our counter broke. It wasn't the most secure structure - a couple of wooden cutting boards balanced on a thin metal frame, so we weren't super surprised. We discovered the back of the frame was held up by an old (now bent) cardboard fireworks shell. Kevin found some old mop handles to wedge against the frame and now our counter is once again fully operational. But otherwise, our house is pretty “normal” until you get to the kitchen. The kitchen is separated from the living room by a large sliding glass door and window. The door is a little small, resulting in a number of banged head and elbows, but I'm still glad it's there. 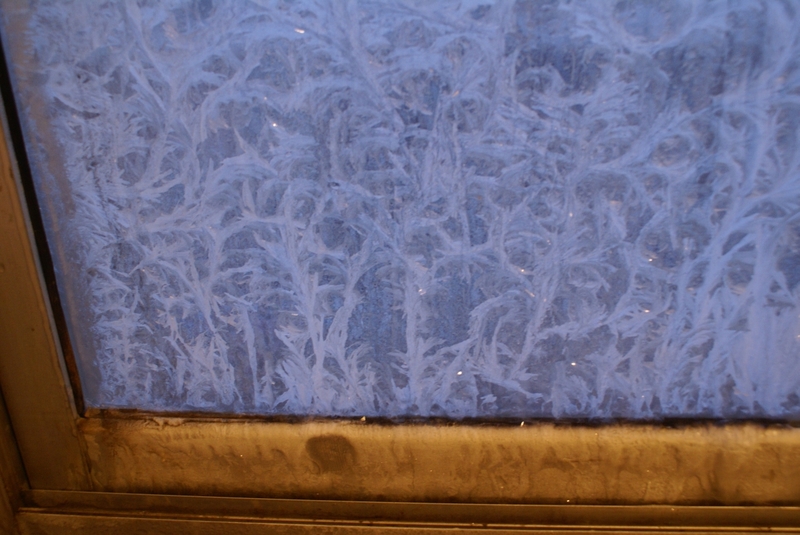 During the wintertime we keep it closed all the time, since the kitchen is at least 10* colder than the living room. 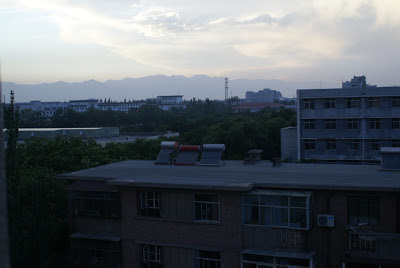 The outer wall of the kitchen is all windows - from the sixth floor we have a great view out over the campus and most of the year we see the nearby mountains. In wintertime the coal dust haze blocks our mountain view, but we couldn't see them anyway because our kitchen windows always freeze over. On the inside. 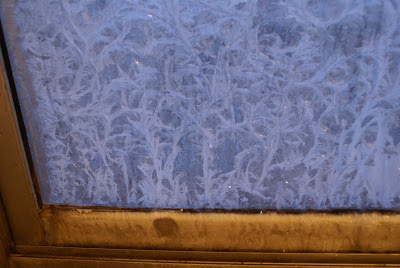 Instead of a beautiful view we have beautiful new ice patterns every morning! 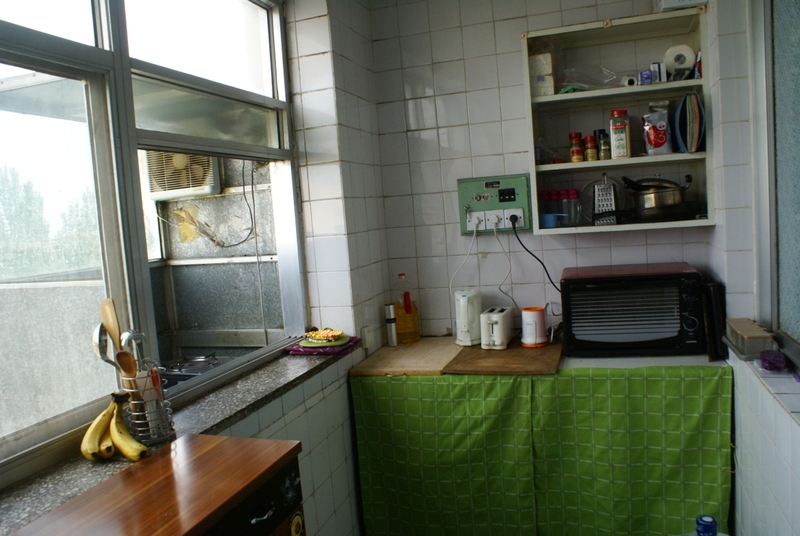 Probably the most interesting part of our kitchen is the stove area. A small box of thin metal has been attached to the outside of the house to hold the single gas burner. It is closed off by small sliding windows, useful in the winter since the temperature inside the stove attachment is about 10* colder than the rest of the kitchen. We have the stove burner propped up on an overturned basin and an extra piece of tile so that you can actually reach the stove. A small hole in the wall connects the burner to the large gas tank under the aforementioned rudely constructed counter. The stove alcove when we moved in. 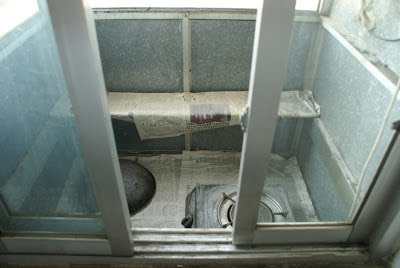 We have since propped up the stove and removed the newspaper that is so wisely surrounding the gas burner! 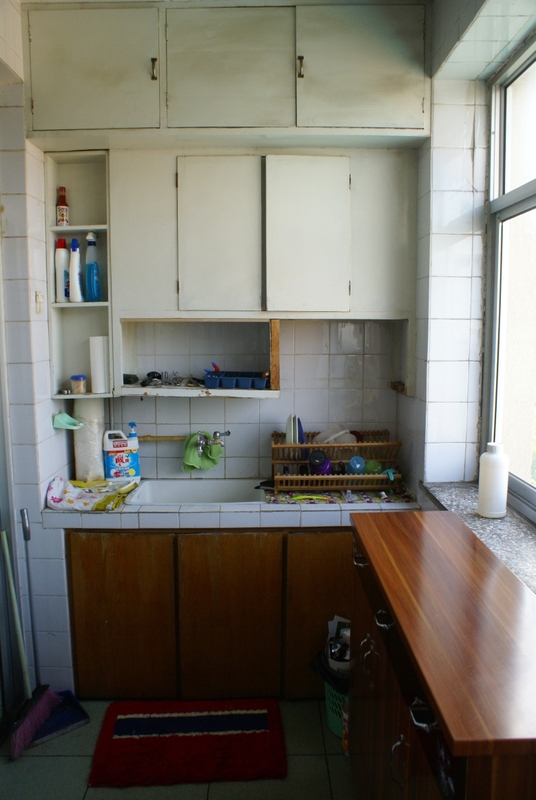 Chinese kitchens aren't equipped in quite the same way as American kitchens. We have a one burner stove. The sink and counter are about six inches shorter than you'd like, unless you are Juliana reaching for a cookie left out to cool. The sink has no hot water. Most Chinese cooking has no need for an oven, but we have a small one we brought from Weinan. It is conveinently just big enough for a 9x13" pan. Unfortunately even though I set it about 50* lower than directed, it still burns the top of anything I don't remember to cover. We have a blender, a hand mixer, a crockpot, a rice cooker, and a toaster (that was hard to find! ), and my little french-press mug, so we're pretty set. We also have a refrigerator, it just doesn't fit in the kitchen so it's in the living room instead. I think the green fabric (covering the gas tank and open storage area) makes the kitchen look kind of pretty! And the cutting board counter tops don't really look too bad. One thing we were very surprised to see in our kitchen was what appeared to be a dishwasher. Who ever heard of a dishwasher in China? Unfortunately it was only large enough for one meal worth of dishes, and more importantly, it was covered in mold. It was quickly replaced by a dish drying rack. Much more useful. I have to laugh when I see magazines or tv shows about kitchen remodels. 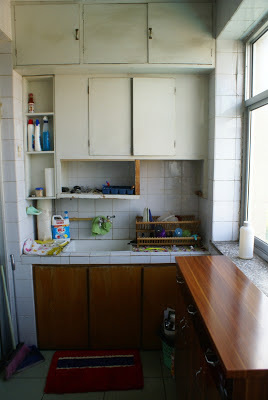 The “before” kitchen always looks pretty darn nice - is it really necessary to spend thousands of dollars to "fix" it? I have to laugh too, thinking, “What if we lived in America and taped plastic on our windows or fixed our counter with an old mop handle? We would seem so trashy!” But here, it just makes sense. We congratulate our friends for their ingenious repairs. Sure, we have a bare light bulb hanging from our ceiling and some of the wall tiles are missing. It would be nice if the kitchen were warmer or a little bigger, but it's really not a big deal. A second burner would be handy, but I'm so used to having one that I'd probably have trouble using two at once. I still think Kitchen-Aid mixers are beautiful, but a little hand mixer serves me just fine, and you'd be amazed what you can do with a spoon! I'm glad we don't have room for more pans or gadgets or a whole knife collection (one large cleaver is as good as 6 fancy knives) - if we had the room, no doubt we'd find a way to fill it. I certainly like American kitchens. They are so pretty and large and functional. When I first came to China I struggled with not having the standard I was used to and unknowingly expected. But now I like my kitchen. It reminds me of what is not necessary. It reminds me that I have everything I need and then some. When I was younger I wanted to be an interior designer and planned to marry an architect so we could have a really beautiful house. Until a few years ago my big dream was to own a home. 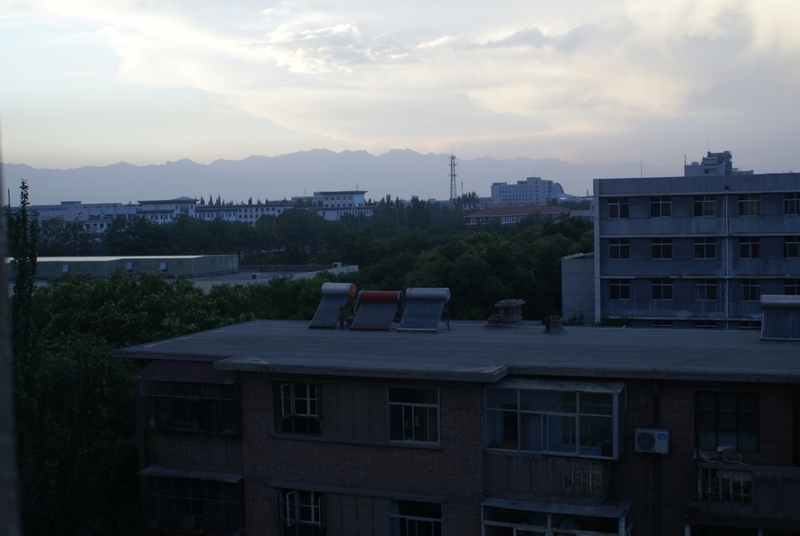 When we decided to stay in China, I realized that might never happen. And recently I've also realized I’m just fine with that. I've got some bigger dreams now. When Juliana has a "good day" - playing well on her own, sweetly saying thank you, taking a good nap and actually eating dinner, I think, "She is such a great child. I'm such a good parent. Why do people parenting is so hard? Maybe it's just that their children aren't as delightful as mine. Remind me to tell them that if they just do exactly what I'm doing, their children will turn out great." It's easy to get caught up in day-to-day moments of life and completely lose perspective. I don't know about you, but I tend to make a big deal out of little things. The other day a friend told me about taking her young barely-toddler boys to an event where they ran around enthusiastically. Nearby another family's six children sat quietly watching the other people, looking exceptionally calm and well-behaved. The whole way home she bemoaned what a terrible parent she must be that she hadn't taught her one year olds to sit still and quiet. I tend to react similarly when I hear about people's children who sleep 12 hours straight at night or love to eat vegetables or play on their own for an hour at a time. I think (and sometimes they say), "If I just parented the right way, surely my child would do that too!" When we see a glimpse of those "perfect children," it's really hard not to freak out a little. I remember when Juliana was 2 months old I started to become concerned that she wasn't sleeping well. Now I laugh thinking, "My goodness, she was only 2 months old!!" but at the time those two months seemed like a really long time. When Juliana was 8 months old and waking up an insane number of times a night, I was convinced she would never sleep well. Seriously, I was just holding out hope for the teenage years when I hear people say their kids never want to wake up. It sounded wonderful. Now Juliana sleeps really well almost every night. But when she has a bad night - usually because of a cold or similar disturbance - I instantly become afraid that this past year of sleeping through the night was just a ruse. Similarly, I make a big deal out of my own parenting choices. I think that breastfeeding is great and I really dislike leaving babies to cry-it-out, but I really don't think these are the end-all-be-all issues of parenting. Some people get really, really passionate about these things. Both sides draw lines and become bull-headed. "If you don't breastfeed your child she will never get into college!" "If you don't let your baby cry he will never learn to sleep!" It’s important to think things through and make informed decisions, but these areas aren't quite as life-altering as people make them out to be. Here is what bothers me: In America we argue about the ethics of “hiding” vegetables in our toddler’s food while millions of children go to bed hungry every night, some of whom never wake up. We are so busy judging others discipline styles that we miss the signs of the child in our church or school who is being abused. We are so embroiled in a “circumcision/no circumcision” debate that we don’t realize millions of girls worldwide are still undergoing female genital mutilation (“female circumcision”) a painfully unnecessary procedure that can cause severe bleeding, infertility, and childbirth complications. The next time I am frustrated because Juliana refuses dinner once again, I want to pause and be filled with gratitude that I have food to offer her. When I am tempted to get involved in a petty debate, I want to save my energy and passion for the things that really matter. There are plenty of issues in the world that should make us angry, zealous, indignant, and grieved; most of them don't even enter our radar. The fact that we have time to stress about the little things means that we aren’t facing the big things. We are so blessed. I've been terrible at posting lately. For every ten times Ruth posts, I manage to sneak something in, so I figured I'd try and make up for it with quantity. I've started uploding a bunch of my photos to a new site called Snap My Life. I'd never heard of the site until I won a photo contest with a shot I snapped of Juliana this summer at the zoo. 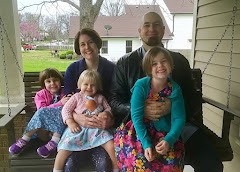 Our fifth wedding anniversry trip to the park. To He Lan Shan with our classmates. Riding through the Hutongs near Ningxia University (before they're replaced by high-rise apartments). A scavenger hunt we had to kick off the semester. 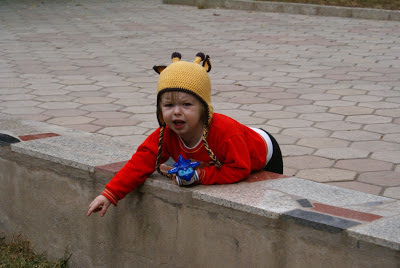 And Juliana's Second Birthday Celebrations in Yinchuan and in Georgia (a bit early). "But the grass is greener over there!!" My wonderfully imperfect child can reject a vegetable from a mile away, spot the sunrise from hours away, and has been known to collapse on the floor because she couldn't have another cracker. I have a friend whose baby was sleeping through the night at 3 months old. At 7pm she happily laid down in her bed and slept peacefully until 7am, then entertained herself quietly for another hour before alerting her mother with happy cooing. At 6 months old this baby sat peacefully on her own, playing with toys for half an hour. At 10 months this baby never threw food on the floor. At 15 months she was speaking in full sentences, most of which started with the word "please." At 18 months she self potty trained. At 24 months she never threw tantrums and happily reached for another carrot stick, no dressing needed. At 3 years old she was not only dressing herself, she was also doing her own laundry and picking out color-coordinated outfits. Do you know someone like this? Actually, me neither. For one thing there's no way we would still be friends. For another thing that child doesn't exist. Our vision of the perfect child is just a compilation of all the enviable traits of a dozen children we've heard of and then dangerously expect our child to be. But one thing we forget is that the child who was indeed a terrific sleeper had a tremendous difficulties with nursing. That independent player is 18 months and barely talking at all. The toddler who loves carrot sticks and brocolli won't potty train until 4. The 3 year old did do her own laundry...flooding the washer and staining all her clothes in the process. When I hear people brag about their child's enviable traits (or bemoan their less enviable ones), I have to think, "What is our idea of the perfect child?" It seems to me that the perfect child is one who interferes with our life as little as possible. He sleeps so much we hardly see him in between naps! He plays so well on his own we don't even have to interact with him! I often think of how much I could accomplish if Juliana didn't want to be with me all the time. There are certainly advantages to encouraging age-appropriate independence, but is a "perfect child" really one who doesn't need her parents? The perfect child is actually a miniature adult. Sure, you get to dress her in cute clothes and she says funny things, but she thinks and acts like an adult. My friends (and I) often express frustration about our children's irrational behavior. If you were happy to eat it yesterday why won't you touch it today? If you stick your finger in there again, of course it's going to get pinched - don't you remember the last time? We expect our children to think the same way as fully rational adults do (forgetting how many times we also do dumb things over and over again when we should know better). The perfect child also seems to be rather lacking in the personality and emotion. He is compliant and passive, happily agreeing to whatever we suggest. She has no opinion (or better yet, she has our opinion) about what to eat and what to wear. She doesn't get upset when things don't go her way (perhaps because she's so rational). Instead she calmly accepts life and lets it wash over her. Sometimes I'm not sure if we've actually gotten over the idea that "children should be seen and not heard." A good child is still considered one who looks nice but doesn't mess up our lives to much. When our children do act like children, when they have big needs or a large personality, we start to wonder what is wrong with them -- Or perhaps more so, what is wrong with us that we can't control them. Everyone else's baby is sleeping through the night. Nobody else's child is screaming in the middle of the supermarket. As parents we have a responsibility to help our children to behave appropriately, handle their emotions, and do things they don’t want to. Some of their actions do reflect on our parenting. But no matter how good of parents we are, we will never have a perfect child. It is unfair to expect it from them or from ourselves. And honestly, if we did have the perfect child, everyone would probably hate us. Is that really what we want? Enjoy your friends (who secretly feel relieved that your child also throws tantrums). Enjoy your imperfect child. "We approached the window, stuck our money into the tiny opening and carefully told the lady behind the glass and the date, train number and what type of tickets we wanted. She took our money, wrote out the tickets (they were hand-written pieces of paper in 1992), and handed them to us. Then, just to verify that we had gotten the right tickets, I stuck my nose back up to the opening and said “shi ba dian ma?” Is 8 o’clock? The lady nodded her head and said back to me, “shi ba dian.” Is 8 o’clock. Two days later we went to the station at 7, an hour before our 8pm train. When we showed our tickets to get into the soft sleeper waiting room, the attendant on duty looked at our tickets and said YOUR TRAIN LEFT AN HOUR AGO!! ...we tried to figure out what had happened? How had we so completely misunderstood what time the train was to leave? It was the tones that had tripped us up. When we said shi ba dian ma, what was in our minds was this: is 8 o’clock? Shi said with a falling tone means “is.” Shi said with a rising tone means “10.” Stick ba after it and together they become shiba, which means 18. We didn’t know if we had said the tone wrong (making her hear it correctly) or if we had incorrectly heard her correct tone. It didn’t matter. The fact remained that we had missed our train because of the tones. (go read the rest of Joann's entire post. (and while you're at it, subscribe to her blog, it's one of our favorites). Her other "Language-week" posts are also worth a read: What Does Ju Mean?, How Long Does it Take to Learn Chinese? and Language Week at Outside-In. This older language-learning post is also good: A Letter to Chinese Language Learners.